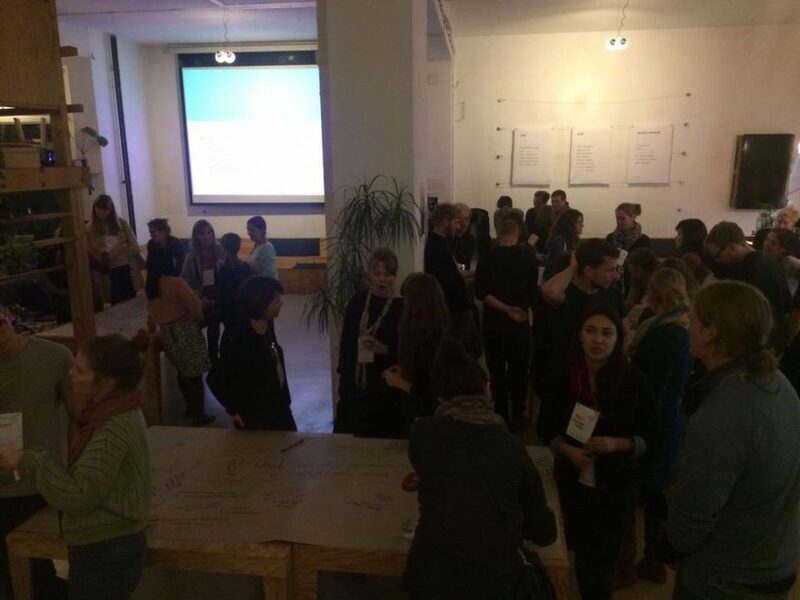 Networking with a Twist: Making Berlin Sustainable Together - GreenBuzz Berlin e.V. Networking with a Twist brought sustainability professionals, project organisers and enthusiasts together to share collective knowledge regarding sustainability issues. Together, they outlined problems they felt existed in Berlin and local areas, identified current projects in Berlin, discussed changes they would like to see and offered solutions for individual behaviour change. 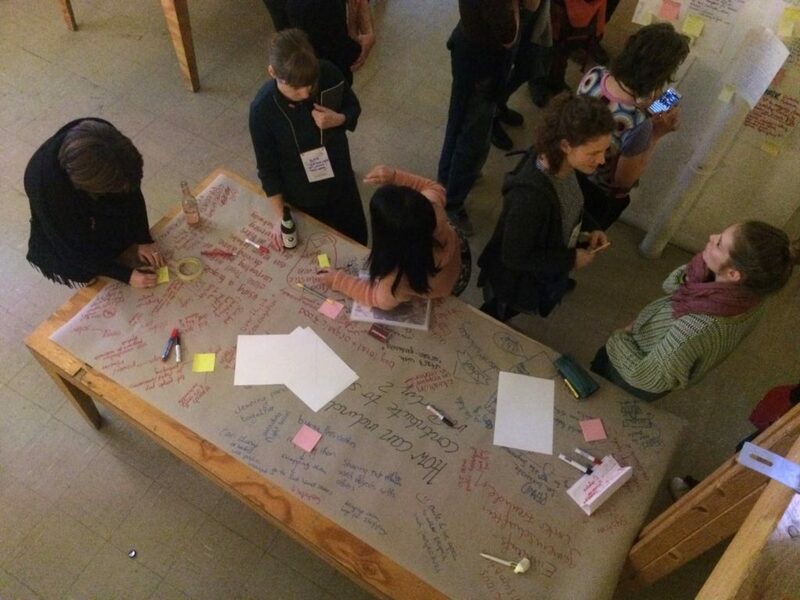 Participants were encouraged to set themselves sustainability goals, connecting and collaborating with people who shared their vision or wanted to be part of the movement in order to create long-term dialogues and relationships. What are the sustainability problems in Berlin/your local area? What needs to happen to create change in Berlin/ your area? What is already happening in Berlin/ your local area? 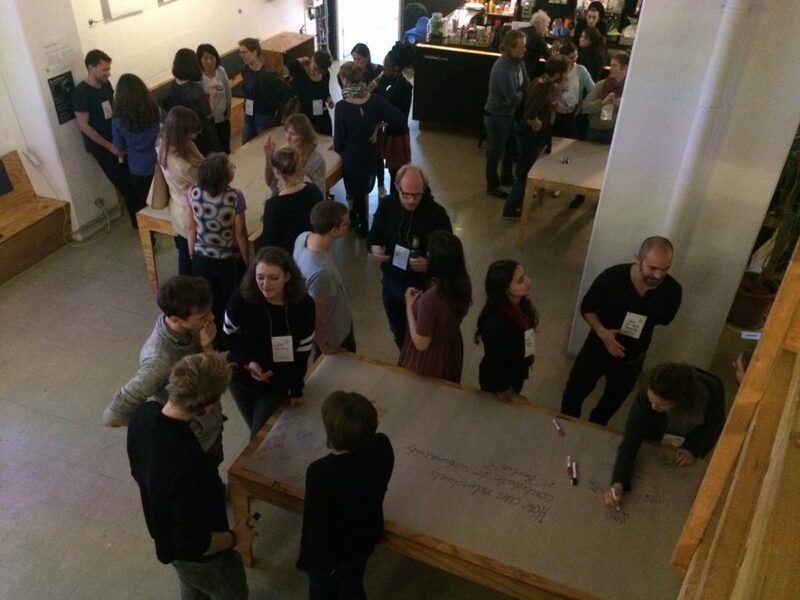 How can individuals contribute to a sustainable Berlin? In small groups, participants discussed the questions on each of the tables and wrote down all ideas that emerged from their conversations. Each brainstorming session lasted 15 minutes discussing each question in a different group. Results from all four tables are summarised below. Finally, individuals wrote their own sustainability goals along with help they needed and anything they could offer. Throughout the remainder of the evening, as people continued to connect over drinks, they read each other’s goals. If readers believed they could help or be a part of someone else’s goal, they wrote down their contact details for conversations to take place after the event. Problems identified in Berlin mainly focused on waste and consumption, transport, urban environment and education. It was highlighted that recycling can be confusing and is not always accessible, whilst the use of plastic, from bags to packaging, is abundant. This means that any plastic that is thrown away leads to both low consideration for environmental consequences and litter. It was also recognised that consumption in itself is not sustainable with over-consumption, particularly of meat. This results in high food waste, which is not always returned to compost. Transport issues highlighted concerned the lack of bicycle lanes, particularly within the city centre, not enough places to park bikes or e-bike rental services. In contrast, results shows that individuals felt there were too many cars, which affected their health and not enough opportunities to make carpooling a more effective option, such as carpool lanes. Results showed that people felt there needed to be more green spaces and pedestrian precinct zones in Berlin. They also highlighted that bad insulation in buildings and apartments resulted in heat loss, which is both ineffective for personal income as well as environmentally. This could be supported with a sustainable housing community. Finally, problems were identified in the lack of education of sustainability issues and solutions for both everyday citizens as well as startups and organisations. Alongside this, sustainability was seen as not accessible to everyone; rather, it seems that individuals have to actively seek information on sustainable living options meaning the individuals attending sustainability events, getting involved in projects or taking up initiatives are already inclined to this way of life. Therefore, it was highlighted that there has to be a new approach to targeting, informing and educating all individuals about the challenges cities face and possible solutions. This would also prevent people from the “bubble life”, where they are only exposed to people with similar points of view. It was recognised that in order to create greater change in Berlin, a system change, particularly around consumption, needs to take place. This change needs to take place at an individual level, at large organisational level and at government level. These included prohibiting plastic, emphasising zero waste and offering lower taxes for ecological products, thereby offering organisations incentives to choose glass over plastic and create biodegradable packaging, as well as offering more organic and local food. Within the transport sector, it was highlighted that the greatest changes would involve better bike paths within the centre of Berlin with more rental bike options. Education for drivers and civilians would make streets safer for cyclists as well as highlighting the benefits and advantages of cycling, making it a more attractive mode of transport. Alongside this, reductions in transport prices and governmental support for more sustainable transport solutions, such as electric cars, would again encourage movement away from petrol cars. There was a general consensus that education and awareness for social challenges and issues needs to be increased, not just for drivers, but also for families who do not have access to this information, with suggestions that sustainability topics could be taught more in schools. This could be done by bringing more local awareness about sustainability within communities, offering more local platforms to discuss needs and events that promote new ideas and collaborations. On a political level, it was highlighted that political pressure regulations would enable more positive change to take place, as well as more referendums and more direct democracy. Compensation for volunteers would encourage more people to work for good causes, supporting projects that might not have the funding for paid positions. Other suggestions included rewarding good actions as incentives for both individuals and organisations. Finally, on a personal level, it was highlighted that changes also need to take place on a mental-emotional level. With a “let’s do it” mentality, individuals would be more likely to take part in events that help them meet with people with alternative points of view, engaging in peaceful conversations and discussions that help bring about change. With more time to think about their own needs and dreams, mental health and wellbeing would increase, enabling people to consider their contribution to society and sustainability as a whole. Whilst the most highlighted problems in Berlin concerned waste and consumption, this was also the most active area in terms of local projects. Food sharing initiatives to reduce food waste, farmers markets and food co-ops were listed as active and accessible projects currently existing in Berlin. Alongside this, a number of urban gardening projects were named throughout the city centre and the outskirts. For startups, businesses and entrepreneurs, various incubators and hubs were identified offering advice, support and information on how to create an organisation with community in mind. This also extended to organisations that support individuals to start new, socially-focused careers. These initiatives help to resolve both individual and organisational challenges faced by those who work within social fields, such as lack of funding, contacts and community, and knowledge and information by offering inspiration, opportunities for collaboration and growth. On a personal level it was identified that there are many actions focusing on conscious consumption that individuals can take that would contribute towards a more sustainable Berlin. With an emphasis on reducing, reusing and recycling, individuals can bring their own shopping bags and coffee cups, avoid plastic, repair clothes and swap household items rather than purchasing brand new items. By upcycling, individuals can creatively reuse useless and unwanted materials, bringing new life to old items. Individuals can also buy more local and organic produce or start their own urban gardens on balconies, cooking at home more and sharing leftover food. They can also be more conscious of their meat and dairy consumption, adopting a vegan or vegetarian diet. By sharing their knowledge and experience on which vegetables are in season, other people can start their own urban gardens, thereby creating a community of urban gardeners. Regarding transport, individuals can travel more by bike or public transport, carpool instead of driving alone and choose electric cars over petrol cars. Taking stairs over elevators also contributes towards personal health. Other suggestions included limiting or avoiding travelling by plane. Finally, individuals can be active citizens by sharing their experiences, getting involved in politics and forming support groups and education centres. Through researching, talking and posting about waste habits and if something is really sustainable, individuals can become influencers, conversing with people with different perspectives and creating system changing dialogues within their communities. 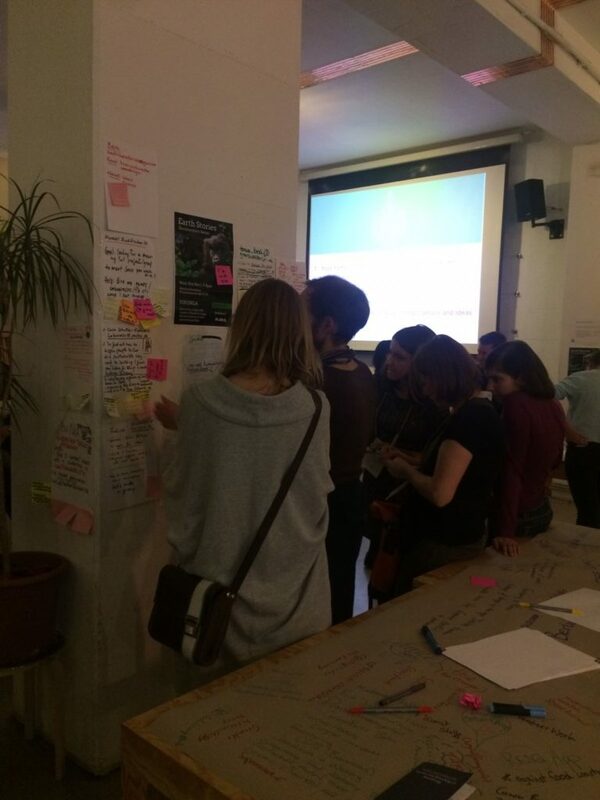 Through idea-generating activities and stimulating conversations that drew on the collective knowledge and experience of the room, participants were able to better understand the problems, initiatives and solutions in order to make Berlin a more sustainable city. With time to connect and collaborate, these discussions will continue into the future, allowing new projects to flourish with the support of other project leaders, volunteers and professionals throughout the community of Berlin.